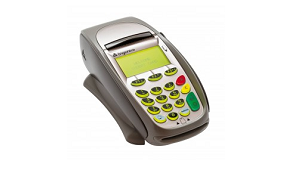 The Ingenico 5100 Dual Module is an advanced, powerful, secure and flexible payment terminal that provides a single solution for electronic transaction acceptance for retailers and restaurants. The i5100 Dual Module is configured with Ethernet to enable retailers to leverage DSL and other high speed communication methods to reduce communication costs while streamlining authorization. The i5100 was designed for fast transaction acceptance with a 15 lines per second thermal printer, high speed modem and powerful 32-bit processor. A simple keypad and large bright backlit display with 3 screen addressable keys make it very easy to use.